lineage that includes Gogol, Yuri Olesha, Bulgakov, and Nabokov. 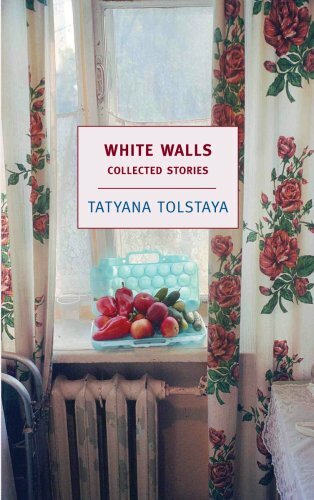 "White Walls" is the most comprehensive collection of Tolstaya' s short fiction to be published in English so far. It presents the contents of her two previous collections, "On the Golden Porch" and "Sleepwalker in a Fog," along with several previously uncollected stories. Tolstaya writes of lonely children and lost love, of philosophers of the absurd and poets working as janitors, of angels and halfwits. She shows how the extraordinary will suddenly erupt in the midst of ordinary life, as she explores the human condition with a matchless combination of unbound imagination and unapologetic sympathy. Jamey Gambrell writes on Russian art and culture. the short story, her writing distinguished by exuberance, a talent for description, a comic sensibility, and more than a touch of the surreal. For one reviewer, "the discrepancy between fondest desires and disappointing reality" lies at the core of her writing, which is "a fiction of vast possibility, propelled not by plot, but by a narrative voice that imaginatively conveys the ambiguities of her characters' inner lives" (Baltimore Morning Sun). Sleepwalker in a Fog (1991) is her second book.